This loudspeaker was "rescued" from an environmental depot in a small town in the south of The Netherlands, close to the Belgian and German border. 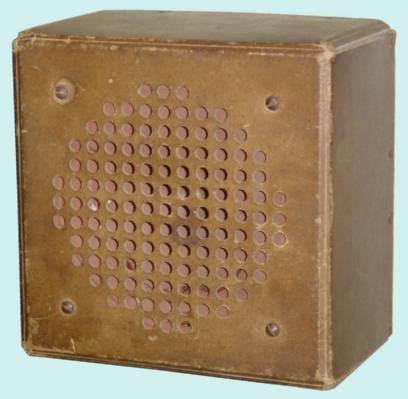 The small speaker is housed in a pressed paper box with a size of 20.7 x 20.7 x 12.3 cm (width x height x depth). By changing the positions of an array of metal contact strips, the impedance of the speaker can be set to 700, 3500, 7000 or 12000 ohm. 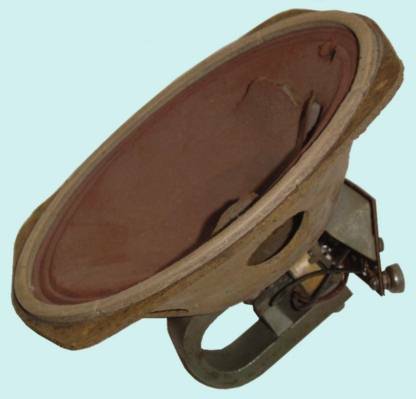 The loudspeaker is developed as a second speaker for civil radios as well as for German army radio equipment and bears the model designation WLSpkl (which probably is the abbreviation of "Wehrmacht Lautsprecher klein" = small army speaker). 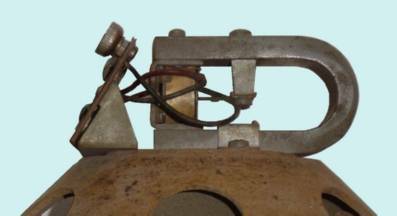 The speaker itself is a magnetic type speaker (very similar to the speaker in the German DKE 38 radios and called "Freischwinger"). Unfortunately, in my case two windings of the speaker coil are interrupted and only the low value impedances can be realised. The tears and holes (visible in the right picture) were repaired with a little bit of glue. In view of the construction material used for the box, it is not strange to read at an inlay paper that the user is advised not to expose the box to rain and snow.